As we have discussed in multiple articles before, having the proper gear is crucial to the game of golf. You know what else is crucial? The way that you carry it! That is right. For golfers, they tend to look at their golf bag as an extension of who they are as a golfer. A golf stand bag says a lot about an individual. It says what the brand they admire, the colors they enjoy, their professionalism on the course, and if they are there for a full round or half a round. With that in mind, it is our intention to share with our audience the top ten best stand bags in the industry but from one particular brand, Wilson! Soft and light PU fabric is very durable. Contoured profile and steel ring construction. Padded umbrella sleeve and three point strap. Highly durable and quality construction. Large pockets for extra space. When it comes to a golf stand bag that is perfect to carry all items but also one of the highest quality designs, this is it! Although this brand is known for their quality products, the first golf bag on the list is one of the best in the industry. 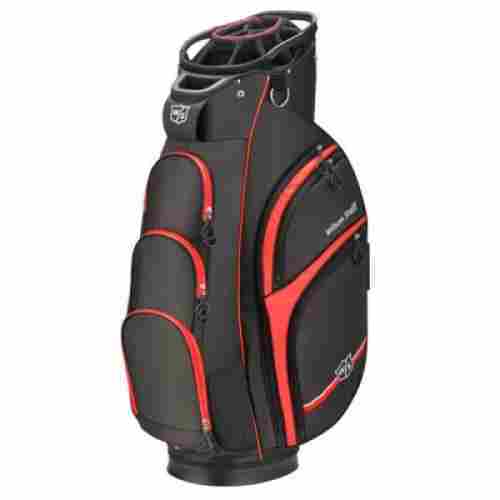 This is the Wilson Staff Pro Tour Cart Golf Bag and here are two features individuals can expect from this product. One of the best features of this particular stand bag is the large front pockets and the accessory pockets. With this, individuals can store shoes, gear, clothing, and other items. With that, the side small pockets are also for personal items where individuals can store a wallet, cell phone, or other important products they may need while on the course. The overall design of this item is beneficial and comes in handy. Alongside this, it is also very luxurious in the way that the product feels. The item has a designed soft and light PU fabric alongside a contoured profile and steel ring construction. The six-way divider and padded umbrella sleeve also make it come in handy. With that, it also comes with a soft nylon hood that is lightweight and covers the product for the occasional rainy rounds on the course. As the first item on the list, we can say that this happens to be one of the most expensive. The stand bag alone costs what a typical set of medium-grade quality golf clubs costs. With this, it is important to note that this brand is one of the best quality brands in the industry when it comes to products and gear. Individuals can expect the product to last a long time. As a last note, this bag also stands by itself due to the flat structure bottom. High quality products and design. Eight pockets for easy usage and carrying. Rip stop fabric is rip and tear-resistant. Different available NFL teams to choose from. Individuals have mentioned the kickstand can get stuck. Now we are cooking with something a bit more reasonable. This next stand bag is quite different than the first, boasting a unique design that is high quality but also intention. In fact, individuals can choose between their favorite NFL team when it comes to the exterior design of this product. Here are two features of the Wilson 2018 NFL Carry Golf Bag and what individuals can expect from this product. If you want pocket space, this item is the product to get. This bag has one full-length garment pocket as well as two large accessory pockets and even two sides mesh base pockets. With this, individuals can carry as many items as they desire easily and effortlessly. Alongside this, the overall ergonomic design ensures the product is easier to carry. This product comes with a wide variety of extra features. These features range from a four-point double shoulder strap to a towel and glove holder, and even an umbrella holder. With this, individuals can expect the product to be quiet useful and serve for the basic needs of stand bag. Overall, the quality of the product is found primarily in the design features and the exterior. If you want to show your team some support, this is the item to get. Not only is it one of the best-designed golf cart bags in the industry. It ensures easy carrying and easy usage. In fact, the stand bag has two poles that allow the product to stand by itself, making it a free-standing bag that is very convenient. Alongside this, individuals can easily carry as many items as they desire due to the many pockets. 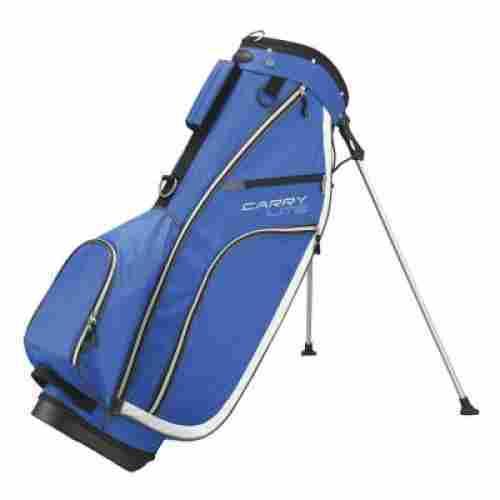 For the price, which is a fraction of the cost of the first item, it is perfect to carry all your clubs. Quality design with full length dividers. Many different sized pockets for easy carry. Coming from the Nexus series by this brand, this next golf stand bag is high quality, boasts one of the best designed material compositions, and it is highly cooler than most! We want to talk about the Wilson Staff Nexus III Cart Bag and what individuals can expect from the design of this overall product. Here are two features to consider of this product! If we thought that eight pockets was a lot, then we are shocked by the fact that with this product individuals are guaranteed fifteen pockets. Yes, this particular stand bag comes with fifteen pockets of space. Therefore, individuals have plenty of storage options to take their products and their gear. Whether you want a large cooler pocket or a valuable pocket, this product has it. With this, individuals are also guaranteed two large pockets and three accessories pockets. The design of this particular golf bag is actually one of the most comfortable. Overall, the design is intended to be easy to carry and very convenient. The fabric is not only one of the best quality, but the design is high quality and ensured to last a long time. Individuals even have separated club entries to better keep each club from scratching each other. With that, the product also comes with a padded strap so it is easy to carry and a rain hood so individuals can cover it in rainy weather. Lightweight and durable easy action stand. Diamond polyester fabric is high quality. Padded double strap and hip pad design. Umbrella holder and other features. The stand is easy to set up. Top separators for protection of clubs. Individuals have mentioned the stand is a bit flimsy. Not as high quality as other bags. This next golf stand is perfect for the individual that does not want to spend a lot but still wants the overall quality of this brand. The Wilson 2015 Carry Lite Golf Stand Bag is one of the most lightweight, but also durable stand bags in the industry if you want an easy to carry stand bag to take your valuables for a quick golf game. Here are two features to consider! The design of this product has the diamond polyester fabric, which happens to be one of the most durable in the industry. The diamond polyester is also moisture wicking and ensures a better rip-resistant design and durability. With that, the item has an easy-action stand where an individual can easily separate and take out the two stand bars so the product stands up by itself. With that, we can say it is very durable and worth the consideration. This item comes with a bit of extras! The design has a double strap and hip pad for better comfort and easy storage. With that, the item has a storage beverage and range finger pocket as well as an umbrella holder and towel ring/glove holder. As a last quality design, the stand bag also has a rain hood for individuals that want to protect the item in rainy weather. 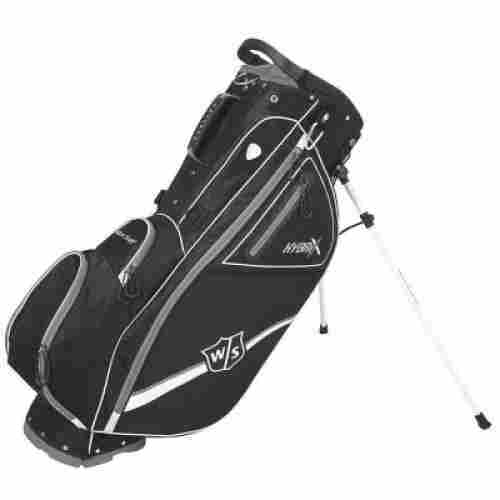 To discuss cost and value for this product, it is important to note that this happens to be a lightweight version of their fullscale golf bags. With this, it only has a couple top dividers and quality features. However, the durability is still there! With this, individuals can expect this stand bag to be the perfect entry-level price stand bag if you want to bring up your quality just a notch. Also, as a travel bag, it is one of the best due to the lightweight design and lack of extras. It is also well priced and very durable! Features three-point double strap design. Pen sleeve and umbrella holder. Individuals have mentioned it is better for amateur golfers. Can be considered somewhat small. This next golf stand bag is made for quality and simplicity. The stand bag has a five-way top divider design, it stands alone, and has plenty of features that make it a perfect entry level bag. With that, the designs and color choices are beautiful, especially the primarily white and blue detailed stand bag. If you want quality, but also simplicity for those quick games, we recommend the Wilson Stand Ionix SL Carry Bag for the features and overall simple benefits. One of the best benefits of this stand bag is the design. The construction quality of the bag makes it super light without sacrificing the overall quality and extra features. Part of the lightweight design is due to the rip-resistant material but also the focus on only the primary benefits of the bag. There are no extra five pockets or other feature, it is more of a simple carry stand bag with the basics. As we said, this bag does not have the fifteen or plus pockets that quality stand bags have. However, it still has plenty of pocket space for it to be a functional quality bag. The stand bag has six pockets, one full-length garment pocket and one valuables pocket, two accessory pockets, as well as other pockets for drinks and tee or balls. With that, it is the perfect amount of storage space for the basic needs. Let’s talk about the cost and value of this product. Not only is it highly durable but it is lightweight and boasts some of the best features for the quality. Overall, individuals can expect the product to last a long time due to the material composition but not act as a full carry stand bag. If you want an easy and lightweight bag that carries the essential, this is it. With that, the price does not even reach one hundred dollars, making it a great starter bag. Lightweight golf cart stand bag design. Five divers at the top. Durable strap and durable zipper. Not a lot of space. This next golf stand bag proves that it can get more simple! This lightweight cart bag is designed to be carried in the cart and it has an easy construction quality that is most simple than most. The overall design of this golf stand bag is high quality, but very minimal and easy to carry. Let’s talk about the Wilson Golf Unisex Profile Bag and two unique aspects individuals can expect from this product. Now it seems we are lowering the pockets! Yes, this item comes with five pockets overall. It is nowhere near as many as fifteen or as high quality as eight pocket designs, but it comes in handy for individuals that want to carry their equipment, a water bottle, tees and golf balls. With that, the pockets are zippered with quality features and designed with great construction quality. 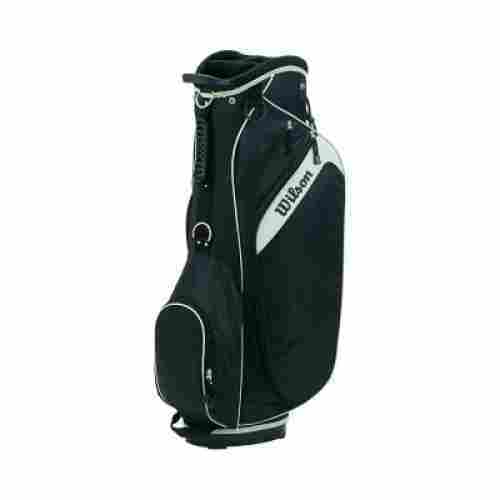 Part of the design of this stand bag is a durable polyester fabric that is very high quality. In fact, polyester is what most golf stand bags are made from. However, it is not rip-resistant or waterproof. With this, it can withstand a bit of rain, but individuals may want to cover it completely when it begins to pour. Overall, the material is high quality and the color ensures no stains can easily be seen. To discuss cost and value for this product, it is important to note that this is a high-quality golf stand bag but very simple. It is a minimal construction design alongside an easy to clean polyester exterior. Now, the biggest benefit is that this is the most affordable bag on this list and individuals can expect it to be perfect for many seasons to come. Overall, this stand bag is better for professionals. Durable design with plenty of pockets. Rain hood and plenty of other benefits. 14-way top with full length dividers. Can be used with push carts. One of the most costly. As the next stand bag on this list, the Wilson Staff Hybrix Carry bag is a hybrid piece of quality ingenuity ranging from a simple design to plenty of benefits. The color choices are very subdued, with only the trim having differentiated colors, but the overall benefits are primarily highlighted in the overall functionality of the product. Let’s talk about two of the best features of this item. So, this item is known as a great quality stand bag because of the overall simple usage of the bag. Although it comes with plenty of pocket space and features, it can easily be connected in a trolley with a trolley anchor or it can stay flat and stand flat with the carrier base. Alongside this, the stand bag also has two pull out kickstands that make it comfortable to use. Overall, one of the best benefits of this product is the design. The design features include six pockets for extra storage alongside a double-padded hip strap and a soft mesh hip pad. With that, individuals also get an umbrella holder, a towel ring, and glove holder as well as a rain hood. The pockets are the true ingenuity with every from two large accessory pockets to a pocket for drinks or a rangefinder. To discuss cost and value, it is important to note that this bag varies drastically from the last couple of ones we have shared. The bag is for professionals has some of the best features that this brand has produced. With that, we can highly suggest the quality of the bag to any individual wanting high-quality durability alongside plenty of pocket space. Quality product designed for professionals. Smooth zippers and plenty of pocket space. Fourteen way full length dividers. Now that we are talking about premiere golf bags. We want to talk about the highly touted professional Wilson Staff Plus Cart Bag. The design is a black and gray bag that is high quality and simple to use. With that, the stand bag has many different features that make it a professional bag to use, practically solving any need that an individual may have. Let’s talk about two of the best features! The design of this particular stand bag has a bottom design that is common among luxury stand bags in the industry. First, the bottom has grooves so it is easy to secure into the base of a trolley and it does not move around. Alongside this, the bag also has rubber lift handles that make the stand bag easy to mount into any position or easy to carry. Part of what makes this product better than most is that it is designed for a full set of golf clubs. This product has a fourteen-way full-length divider design for better club organization. With that, the product also has seven pockets for easy carrying of many different items. The pockets include two large garment pockets, one ball and accessories pocket, a rangefinder pocket, and two umbrella holders as well as a Velcro glove patch. To discuss cost and value for this stand bag, it is easy to say that this is one of the best stand bags when it comes to the overall features. It is easy to mount, easy to carry, easy to store your products, and it is a full-quality professional stand bag for all fourteen clubs. With that, individuals can expect the product to withstand the test of time and be highly durable. For the price, which is it on the higher end, individuals are opting into a lifetime of use and a quality golfing lifestyle. Lightweight stand and base stays flat. Four pockets for easy carrying of gear and items. Four point ergonomic strap for easy carry. Padded areas for better comfort. Comes in three color choices. Umbrella hood and glove holder. Before we finish our list, we want to talk about another quality stand bag that is quite simple in the design. We had to include at least one more quality stand bag made for amateurs and the quick-golfer. This is the Wilson Wilson Staff EXO Carry Golf Bag and here are two features individuals can expect from this particular stand bag. Although this stand bag is quite simple, it happens to have quality features. Some of these features include the pocket design, which has smooth zippers and padded interiors. The pockets include a full-length garment pocket, accessory pocket, water bottle pocket, and a valuables pocket. With that, the ergonomic design makes it easy to carry and even has a lower back pad for better comfort when carrying it. Part of what makes this product ideal for amateurs is the lightweight design. The design is easy to carry, has padded straps and areas for better comfort, has an ergonomic handle, and even has a couple small features such as an umbrella holder and rain hood. With that said, this is the most lightweight stand bag we have shared weighing only about three pounds. As one can already tell, this item is better designed for amateurs and individuals that want to easily and effortlessly carry a couple clubs and gear. With that, the price is very affordable and is among one of the best-priced golf stand bags from this brand. Overall, it is designed well, for comfort, and boasts a slew of great quality features. Full length dividers and three lift handles. Quality product designed to last. Four different color options to choose from. As the last stand bag on this list, we wanted to share one of the best-designed quality bags from this brand. Boasting many quality features alongside a beautiful and aesthetically pleasing design, the Wilson Staff Xtra Cart Bag is designed for professionals and for individuals that want a lifetime of quality use. If you want a sturdy design, alongside comfort benefits, this is the stand bag for you. Here are two features! It seems that pockets are a trend when it comes to professional stand bags. Well, this one has eleven total pockets so individuals never have to leave anything behind. It does overall, cause the product to weigh more than it’s intended five pounds but they are designed for durability and some are even padded. The pockets include large full-length pockets, valuable pockets, and even an insulated pocket for water bottles. One of the best design elements of this product is that it actually comes with many unique features that we have not yet talked about. These unique features include an oversized putter well that fits oversized putters and makes it easy for individuals to be able and access it easily. With that, it also has a rain hood cover as well as a trolley base anchor design. To discuss cost and value, this product is designed for professionals that want to travel with their stand bag and enjoy the many benefits of the different pocket space and quality. With that said, the features make it a great purchase for the price. In fact, this stand bag has been priced much less than it should be and overall it is a great quality purchase for the price. When it comes to this set of particular products, the first criteria that we took into consideration and found to be one of the most important is the overall purpose of the stand bag. The reason being is that we wanted to include a wide variety of stand bags. Now, one would think that the main purpose of a bag is to transfer your clubs, and it is. However, the design of the bag says if an individual will be playing a full round, half round, or if the bag is better designed for amateurs. For instance, a bag that only holds seven clubs is designed for amateurs or individuals that only want a lightweight travel bag. Therefore, it was our primary purpose to share a wide variety of stand bags that were all designed to last but could be used for different occasions. As part of our research, we found these to be the main stand bags in the industry when it comes to Wilson. Stand bags for lightweight use. Stand bags for half rounds. Stand bags for full rounds. With that, it was our intention to share the best products from at least one of each of the categories above. Of course, one bag can fit more than one purpose such as made for professionals but made for travel as well. Which brings us to the next most important criteria that we took into consideration. This criterion was one of the most important for many reasons. Not only did we want to share durable stand bags, but they had to have different functionalities. Of course, not all stand bags are made to be the same. Therefore, our selection is vast when it comes to functionality. For instance, there are stand bags that are made to have eleven pockets while there are some that are made to have five. Therefore, the stand bag with eleven pockets is made for individuals that want plenty of space to carry all of their items, while the five-pocket bag is a simple carry bag. Primarily, functionality was important in the area of space. Not only did we want to share quality stand bags, but we wanted to share items that had enough space to carry around all of the clubs an individual may need. Of course, a seven-club bag will not be able to take everything, but we have included multiple sizes so individuals have a selection to choose from. Now, when it comes to carrying around and lugging fourteen clubs, the bag has to be made to be durable. Which are the last primary criteria that we took into consideration? As the third criteria, we found durability to be crucial to the overall design of the stand bag. The reason being is that no individual wants to invest hundreds of dollars into a stand bag that will break after a couple of rounds. Therefore, we found the stand bags above to have some of the best features when it comes to durability. Whether they are made of polyester or nylon, here are some of the features individuals should look out for when it comes to durability. Well constructed and supportive bottom. Padded and easy to use interior storage space. Quality and padded pockets if possible. Shoulder strap and carry strap design. Portability of the stand bags was a crucial to finding the best Wilson golf bags. You don't always take a golf kart with you to every hole or at all so you want to make sure that the bag you buy is easy to move from one hole to another. And you don't want to be wasting all of your energy carrying your golf bag because it's too heavy either. Golf bags used to be a lot heavier than they are today but that doesn't mean they don't get heavy. Golf bags are kind of an awkward size and shape to be carrying around already, so the good news is that stand bags tend to be lighter than most other golf bags because they are made to be carried around With that in mind we wanted to make sure that it had good, strong straps. We also looked for stand bags that had some padding on the strap so it's more comfortable to carry. It's easy to see why stability made our criteria list of best stand bags, because that is the greatest appeal to these bags,. We read reviews to see if people had problems with any of the stands to make sure they wouldn't collapse under pressure or break off easily. We wanted to be sure the stands were built strong, and durable so you don't have to worry about it falling over on you and spilling or damaging your equipment. It would be really bad if it fell over in the middle of your game because the stand started to bend under the weight. The average golf bag can weigh as little as four pounds but keep in mind once you add your golf clubs and other golf items it can weigh around 20 pounds. Keep that in mind when buying a stand bag if you have a bad back or shoulder pain because that is only going to make it hurt worse. 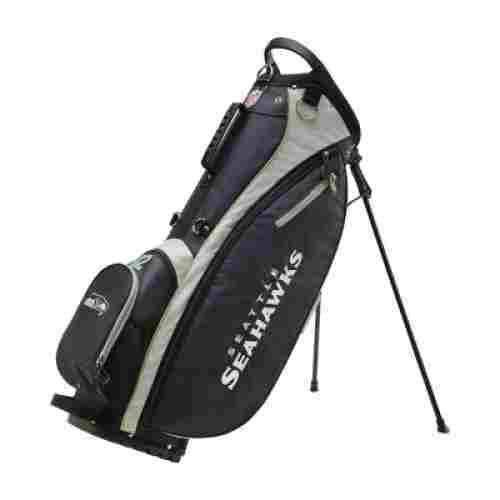 There are some golf bags out there that you can get specially made for you whether it's your name written on it, or deigned after your favorite football team like number two on our list the 2018 NFL stand bag that is available in all NFL teams. When it comes to deciding between a stand bag and a cart bag you want to think about what you need more of. A cart bag is going to have more pockets with lots of room for extra golf balls, and tees but is going to be heavier than a stand bag. Cart bags also don't stand up very well on non-flattened surfaces. A stand bag is usually lighter than most golf bags because it's made to be carried from hole to hole. It has two stands built into it so it won't fall over while you take your swing. But it doesn't have as many pockets as other golf bags so you're not going to be able to pack as much. So, what it really comes down to is do you need more pocket space you might want to choose a cart bag. But, if you're going to be carrying around your golf bag for most of the day you're going to want to get a stand bag. If you're still not sure just know that stand bags can also be placed on a cart and be carried that way. q: Is the stand bag waterproof? As one of the key questions to consider. We found that no stand bag is in fact, waterproof. However, the exterior of the bag has different measures to protect against a bit of rain. These measures include a moisture-wicking exterior material as well as a rain hood for durability and safety. q: How do I clean the stand bag? When it comes to cleaning your stand bag, it is crucial to clean it with a damp cloth and wipe it down when needed. With this, individuals can expect the item to last the test of time. q: Is the bag self standing? As the third question, we can say that we only shared a couple of products that are not self-standing. A self-standing bag will either stand because of a flat bottom or because of two legs that can be adjusted. q: What is a low-profile stand bag? A low profile stand bag is a particular bag that is made to be less bulky and taller than other bags. With this design, individuals are guaranteed an easier way to take out the clubs from the bag.